Have you ever wondered how your business listing ended up on search sites such as Google or Yahoo without ever lifting a finger? It’s like an invisible feed of data is pouring directly into the search engines, providing them with a wealth of data about all the local businesses in America. But where the heck is it coming from? Back in the ‘60s if you wanted to market to a group of businesses within a specific industry you had to compile your own lists. This took time and a lot of elbow grease. There was a need for a streamlined process of reaching businesses or individuals that fell within a specific demographic. Data aggregators were created to solve this problem by compiling lists of data and selling it to businesses. Back then data aggregators sold their data primarily to phone books (yellow pages) and marketers looking for segmented lists. When phonebooks became obsolete (courtesy of the internet) these aggregators pivoted and began selling to online directories. Today they compile data from public records and various other locations across the internet and feed this information directly to online search engines. There are currently four primary companies within the United States that amass local business data and feed it directly to local search sites, such as Google, Yahoo, Yelp, Citysearch, and others. The aggregators generally collect data from public records and then rely on the businesses themselves to verify that the information is correct. But the problem is that hardly anyone even knows they exist. So business data usually remains fragmented, incomplete, and often inaccurate. And let me tell you, the inconsistency of business data across the net is disastrous for local search engine optimization. In other words, if your data is messed up, people won’t find you online. The good news is that with little effort you can contact each of the data aggregators and have them tidy up your business details. By going directly to the aggregators you can avoid updating every website that hosts your information. With the hundreds of search sites out there this will save you a lot of time. 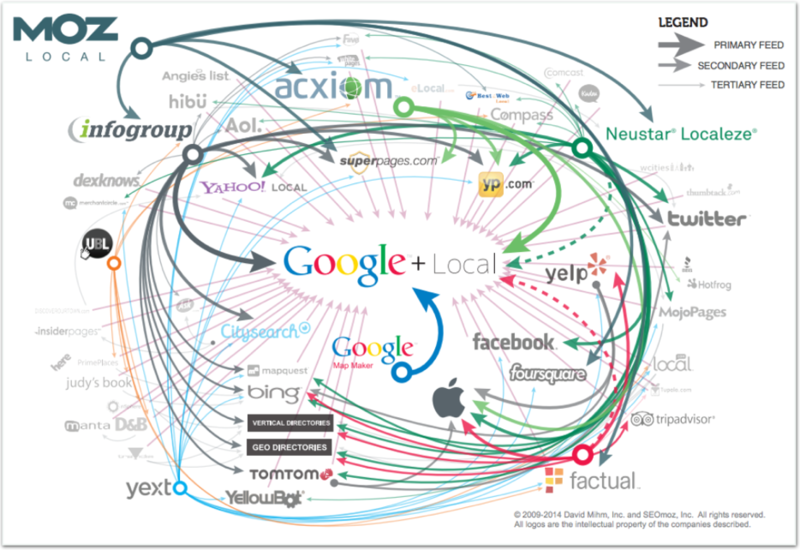 This graphic created by Moz Local outlines the complexity of the local search ecosystem. Data aggregators send updated business information to hundreds of search sites across the internet. Rather than updating each website individually you can control your business data from the source. This ensures that prospects and clients will call the correct number and visit a valid address. There are dozens of factors that play into local search optimization but consistency of business Name, Location, Place, Website, and Category is at the top of the list. This way if prospects are searching for a business within your industry you are much more likely to make the list. For example, the search query ‘home insurance’ is much more likely to yield local agencies that have consistent, verified, and accurate listings across the internet. Think of it this way: Google makes 90% of their revenue from advertising. Businesses advertise on Google because so many people use their search engine. All these people use Google because they trust it will provide them relevant and quality search results. Google wants to maintain this fact, so it chooses to display local businesses that it trusts online. This trust is established by finding businesses that are consistently listed across the internet. 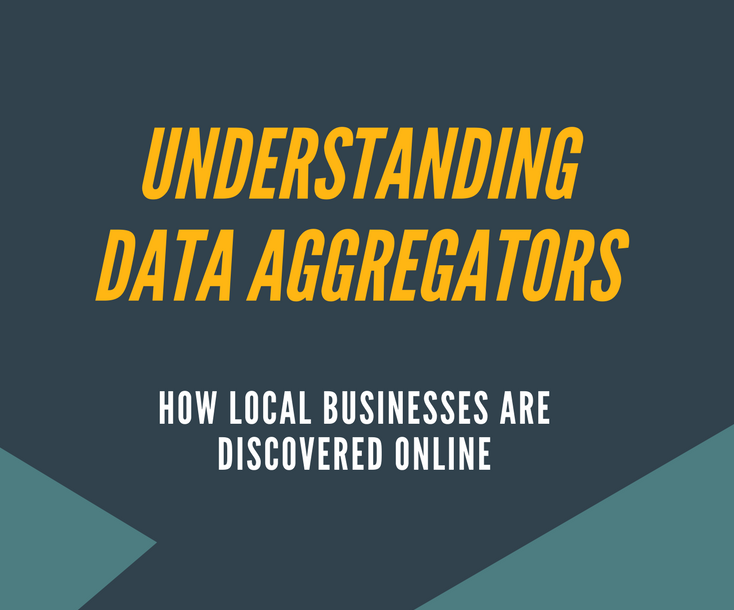 Businesses can be listed correctly and consistently on the internet by providing accurate information at the source: data aggregators (or paid data facilitators, more on that below). Several aggregators send additional information to search sites in addition to the basic Name, Address, Phone, Website, and Category. They will also include business description, hours of operation, and links to social media. More and more ‘big data’ is being shared with search engines each year. Companies like Foursquare for example have been collecting consumer buying behavior for years, tracking frequency of visits, and correlating buying habits with relevant businesses. Three of the four major data aggregators are currently free for a business to update and verify their listings. As of now Localeze is the only aggregator that is charging a fee. The others may charge a fee in the future, so don’t hesitate. I recommend working your way down the list beginning with Infogroup. Each aggregator has a slightly different process for verifying your business, yet they are mostly straight forward and instructions are giving on their website. Expect to spend 10-15 minutes for each. For additional information on the aggregators check out the page we’ve created for each. Keep in mind that even if the search sites appear to be displaying your business information correctly there is still a lot of value in claiming and verifying your listings on the data aggregator websites. Verified listings push to more websites and also improve your local SEO. Data aggregators push important contact information to various websites but they do not encompass a social media strategy. It’s still necessary to stay active with your social media platforms (Facebook, Twitter, LinkedIn, Google+) and collect online reviews on third-party review sites (Google, Yelp). Make sure all your business information is consistent between each data aggregator. This means the exact same business name, address, phone number, etc. Even slight variations can make a negative impact on your SEO. Be sure to use your local business number, rather than a toll-free number or number outside of the area code where you’re physically located. Local SEO places much more emphasis on businesses with a local phone number and several aggregators even require that you use it. Honestly by now this should go without saying. But if you don’t yet have a website then you need to pronto, chop chop. It gives you needed credibility and also plays significantly into SEO. Make sure you have Twitter, Facebook, Google+, Yelp, and LinkedIn pages at a minimum. Several aggregators will ask for this information and it is important to stay consistent. Businesses with multiple locations should have unique social media pages for each of their locations (especially Google+ and Facebook) and point the appropriate page to each location on the data aggregator. If you are a business with multiple locations make sure you verify each of them. The same rules apply to each in that they should be optimized for their local community (local address, phone, social media, etc.) Be mindful of incorrect or duplicate listings online. There is an easier way of updating the major aggregators (and cleaning up duplicate business listings). Paid data facilitators. Essentially they have platforms with more user-friendly interfaces that allow you to verify and update your business listings from a single location. These companies essentially push information down to the data aggregators on your behalf which is then distributed to the search engines. In some cases they also have agreements directly with various search and social media sites allowing you to more quickly perform updates while adding additional services. These include enhanced business descriptions, photos, and review tracking. Because local search is evolving so quickly the paid data facilitators are providing a more solid front-end experience for the consumer. The majority of this service is offered for free via the data aggregators but there are paid options available. The most popular paid data facilitators are Moz Local and YEXT. Moz Local will update your business listings and send them to the four major data aggregators mentioned above (in addition to Foursquare) for $84 a year. This platform allows you to centrally control your business data, so you don’t have to deal with multiple aggregators. They also send information to Localeze (who charges $297 alone). If you are considering a paid option I recommend using MOZ Local. Another option is YEXT. This company has done an outstanding job with their marketing and business development. They’ve forged agreements with several prominent search engines to give the impression that you require their services to update you business listings. One of these is Yahoo. If you attempt to edit your listing on Yahoo Local you’re shown the pricing page for YEXT. But, as I indicated earlier, data aggregators are equally as effective at updating your business listings as are the paid data facilitators. YEXT does offer enhancements, an improved user interface, streamlined process, and integration with a couple additional websites. But they are also quite expensive. Their basic and premium packages will cost you upwards of $499 – $999 a year. Ouch. This is a lot, especially because they aren’t brining much additional value to something you can do by yourself via the data aggregators (or by using Moz Local). Keep in mind that improving the reputation of your business listing online will go a long way to increasing the likelihood that you’re discovered online. So all those hot leads are funneled to you, instead of the guy/gal down the street. What about Bright Local? – Do you think this service is good enough? Moz and Yext seems much expensive than Bright Local. We just verified using Bright Local and 3 or the big 4 now have our data. Took a little over a month. Happy with the service and will likely use again for other clients. My question comes in as to should we now go and claim these existing listings on the 4 aggregators ourselves in order to update in coming years? Or do we keep paying Bright Local? Once they claim in on our behalf, I wonder if we even have the option to claim it. Not a huge fan of mo* local. Still had bad info on 2 aggregators after a year.